Match-winner Rory Hale celebrates after the EA Sports Cup semi-final win over Sligo. RORY HALE is hoping his screamer in Sligo which saw Derry City progress to a first League Cup Final in seven years can provide the spark to re-ignite the club’s faltering season. The energetic midfielder joined the Brandywell club from Galway with the intention of winning silverware and the former Aston Villa man’s memorable match-winner at the Showgrounds on Monday night has ensured he’s just one match away from getting his hands on the trophy Derry last won in 2011. With First Division Cobh Ramblers awaiting them on September 16th next, it’s a great chance to bring some silverware to the club for the first time since 2012. “It’s going to be tough no matter what. Cobh beat Dundalk and they’ve spanked us twice this season so it’s going to be a tough, tough game no matter what. The FAI will perform the draw for the venue of the EA Sports Cup Final in Cobh’s St Colman’s Park next Tuesday as part of the week-long series of events for its AGM which takes place in Cork. 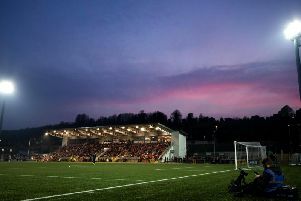 Hale is hoping the new-look Brandywell Stadium is drawn out of the hat to hand the Foylesiders a significant advantage with a big crowd behind them. With the September showpiece put on the back-burner for now Hale is hoping the morale-boosting victory can finally kick the Candy Stripes into action. Despite a recent blip in the league, Hale reminds us that City are still battling on three fronts and he’s confident they can catch Waterford in third and go on an extended FAI Cup run. During a season which has been peppered with inconsistencies and disrupted with the many comings and goings through the Brandywell gate, Hale has been a mainstay and his form has rarely faltered. He’s missed just two games through suspension and despite the many struggles the club has faced this season, he’s relishing a campaign for club and country which has saw him score 14 seconds into his Ireland U21 debut and make his Europa League bow with the Candy Stripes. His rocket against Sligo has breathed new life into Derry’s stuttering season and with a first senior final appearance already in the bank thanks to Hale’s heroics at the Showgrounds on Monday night, he’s already eyeing success in the FAI Cup - a campaign which begins against Blarney and another long trip to Co. Cork this weekend. Monday’s cracking strike was his second goal in the red and white Candy Stripes and he was just happy his younger brother Ronan returned the favour this time by adding an assist. “It was brilliant,” he recalled. “Ronan did some great work down the left and slid it into me, I beat a man, took a touch and walloped it into the top corner. “The first 20 minutes we were both trying to get a feel for the game. We didn’t want to be too open. We did really well, I took my chance and we defended brilliantly after that to get the result. “It’s usually me assisting him so thankfully, for a change, he’s passed the ball this time,” he smiled. His parents don’t miss too many games since he’s joined the club but they’ve managed to miss both games he’s found the back of the net and he’s happy for them to follow the remainder of the season on the radio. “I just can’t score at the Brandywell so if only I could play away every week. I’m loving getting on the scoresheet. My ma and da may stay away now because every time they’re not here I’ve scored so they may listen to it on the radio from now on,” he laughed.